The Monday before Christmas a huge section of my neighborhood experienced a power outage for about an hour and a half which doesn’t sound too bad, except that I was babysitting a 2 year old child, and each power outage means no community-well water (that’s country living). The power continued to go off, then pop on as many as 8 hours later until we went completely black for good December 23rd. This time the power company predicted power outage for several days. 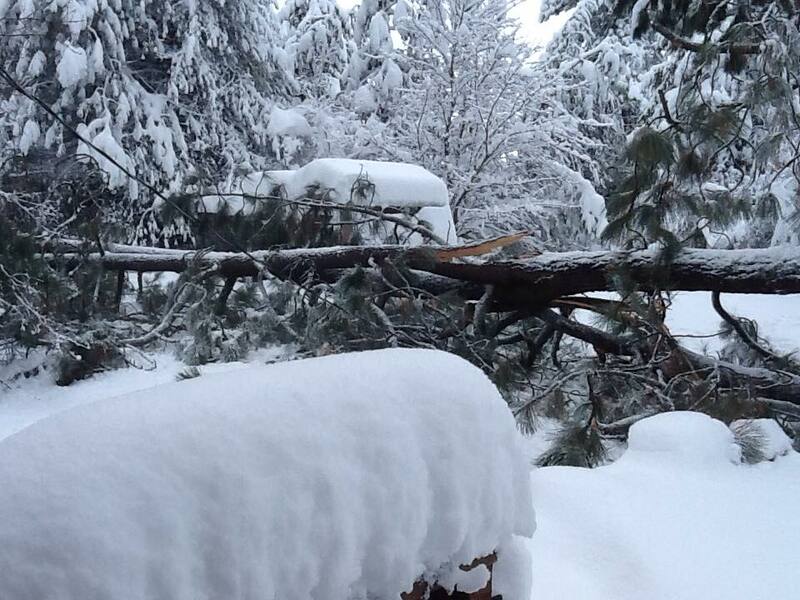 A massive snow storm hit our heavily wooded Northwest area downing hundreds of trees, knocking down power lines, and leaving thousands of homes in the dark. Just as I was brooding over our pre-Christmas overstuffed refrigerator, no power, and no water, I distracted myself by going upstairs for wrapping paper. I was rummaging through a closet, flashlight in hand, when I heard it. A giant crunch-snap that sounded more like a gunshot. The floor beneath me shook and the walls rattled. Is this an earthquake or did a tree just fall on our house! Exploding with adrenalin I rushed down the still vibrating stairs just as the electrical breaker panel box door, recessed in the wall above the stairway, popped open right in front of me. What is going on! It felt like something out of a paranormal thriller. Once on the first floor I looked out the nearest window which faced the back yard, knees shaking. There, between the back deck and a couple of garden sheds lay a good part of our giant bull pine estimated to be about 120 feet high. This tree, which had grown into the shape of a Y, was heavy with over two feet of wet snow and lost one of its 80+ foot “arms” then fell across the yard and into our garden destroying the garden fence and smashing into our metal greenhouse frame. Thankfully, the tree-sized branch just missed the grape arbor and a bunch of other trees by a few yards. See picture above taken from deck, notice stretched wire. I then noticed our electrical line from the house to the street bowing on the ground, held tightly under the trunk like when one pulls an arrow back on a bow. Two of the three wires that came out of it near the house were no longer attached, and were exposed with only one wire tightly stretched still connected to the house. I knew right then that whenever the power came back on we’d be in trouble. My focus went back to the wreckage, taking the surreal scenery fully in. Thank you, God, thank you it didn’t hit the house or any of us or our dogs. I heard myself whisper. And that’s when it hit me. Regardless of the situation there was indeed something to be grateful for here. And I was ever so grateful! Christmas Day came, still no power, but we got water around noon which meant the power company was working nearby. We saw a power company rig near our house with no one in it; the workers were deep into the trees. Concerned live wires could be hazardous with those two exposed wires and with that overly stretched wire hooked to our house, I quickly wrote a note explaining the situation, slipped it in a zip-lock baggie and asked my husband to place the note on the rig’s windshield for when they came back. We had immediately reported the downed tree and broken wires after the tree fell, but one can never be too cautious at times like this. Soon they had disconnected and safely bound the broken line. Within an hour the whole neighborhood was live Christmas afternoon, except us. I felt the sting of the gloomy bug once more. With Christmas and the size of the storm I didn’t anticipate getting an electrician for days, maybe even longer! Unbelievable, we are the only house without power because of that tree. Lord what are you trying to show us. Why this tree? Why Christmas Day? I grumbled but then remembered how the tree had miraculously missed our house and how thankful I was God looked out for us. Despite everything, I had a home warmed by a wood-stove-crackling fire and pots of boiling water, and we were safe. Christmas Day and all my husband immediately found an electrician who not only answered the call but would come the next morning, which was a miracle in itself. But once he fixed the box, @ $405, the power company still had to come back and reconnect the power line; they were terribly overbooked with problem lines. Miraculously, by about six December 26th evening, we were live. Considering the possibilities we got off pretty cheap and very safe. What made this whole situation worse was that we’d just been without power for 5 ½ days and had no water for 3 ½ just days before Thanksgiving, that time a powerful windstorm broke through our area downing trees leaving many thousands powerless for weeks. My perception of the ordeal could have gone two ways. Grumbling and frustration or gratefulness over God’s protection. It certainly made life much less complicated to choose the latter. Oh, and just before New Years day, another tree-sized branch that was part of the tripod, broke off. It wiped out a house, but thankfully it was only a birdhouse, and just missed the newly attached power line and everything else. God still watching over us. Someone mentioned how “lucky” we were that the power was off when the electrical wires were ripped out. “You could have had a lot excitement had your power been on,” he said referring to a possible fire. “Luck had nothing to do with it,” I said. And yes–we have someone coming out to inspect the rest of the tree still standing. Thank God he kept you and your husband safe. Electricity is certainly something that makes our lives easier. God’s love and protection were certainly there for you. Praise God! Amen! Thanks you so much Pure Glory!